Cornerstone Records Management emerged in 2008 when Sterling Partners, a private equity firm, sought to build a national, full-service provider of records and document management solutions. The progressive acquisition and merger of companies gave Cornerstone hardcopy storage, document destruction and rudimentary document scanning capabilities. To expand from a regional to a national footprint, Cornerstone needed to implement a sophisticated document conversion solution that could be centrally administered but implemented locally. Cornerstone also needed to offer its customers secure hosting capabilities. Cornerstone turned to DocPoint Solutions, and its parent company Quality Associates, Inc. (QAI), to help it develop the needed competencies in enterprise distributed capture and electronic content management (ECM). DocPoint Solutions, a Microsoft Gold Certified technology solution provider and consultant, specializes in designing, implementing, supporting and training related to Microsoft® SharePoint® Solutions. QAI offers software applications, hardware and systems for scanning and imaging; systems integration, support and training; and strategic consulting. 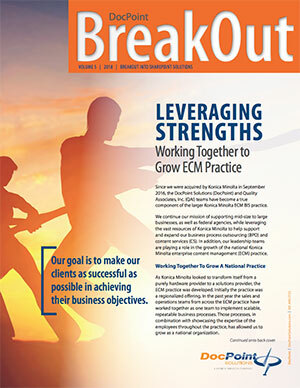 Cornerstone’s desire to launch a new business line posed many challenges. Beyond the complexities of analyzing and devising a comprehensive solution that would be cost-effective to launch and responsive to current and future customer requirements, the issues of developing intra-company understanding of the business space and its technology, plus training sales personnel to sell the product line effectively, were paramount. 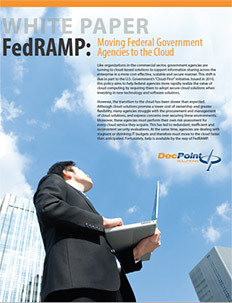 DocPoint’s industry perspective, and symbiotic relationship with QAI, enabled it to undertake both tasks with ease. Relative to the capture and backend storage pieces, DocPoint knew the solution had to be scalable, cost-effective to deploy, reliable and robust enough to handle diverse customer needs. Plus, it had to accommodate the migration of customer data created with the simple ASP solution Cornerstone had been using. The DocPoint team, in concert with QAI experts, helped Cornerstone analyze and evaluate several different capture tools, eventually deciding that Fujitsu scanners, coupled with Kofax capture, and HP servers and storage devices, offered the functionality needed and the future flexibility desired. 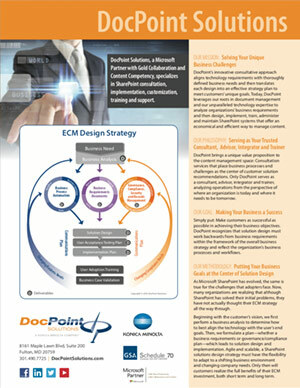 On the content management side, DocPoint reviewed several ECM solutions with Cornerstone’s Director of Imaging & Electronic Data Storage Garfield Drummond. 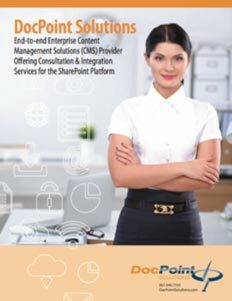 Microsoft SharePoint quickly emerged as the most cost- effective, secure and scalable candidate system. It could easily integrate with Microsoft-based organizations and accommodate new third-party solutions as changing business process requirements demanded. DocPoint recommended integrating Atalasoft image viewers and AvePoint’s reporting module to Share- Point to provide desired functionality. With these two major pieces in place, Cornerstone faced one remaining challenge: identify a secure hosting capability for the national customer base it sought to develop. Here, the infrastructure cost for enterprise distributed capture and ECM became key factors. DocPoint recommended that Cornerstone consider minimizing its upfront investment costs by engaging a hosting firm. DocPoint identified two industry leaders that could deliver affordable IT services securely, while maintaining preserving the centralized control Cornerstone desired. Ultimately, Cornerstone selected Fpweb.net, a national solution that was affordable, reliable, secure and able to meet virtually unlimited capacity requirements. The DocPoint-QAI team fully trained the Cornerstone personnel, especially the sales staff, in the hardware, software and value that its new Scan On Demand Solution offered potential customers. The combined expertise of QAI and DocPoint enabled Cornerstone to expand its business service portfolio and take the next step toward becoming a national, full-service provider of physical storage/destruction, virtual digitization and secure hosting. The devised Scan On Demand Solution offers both back-file and day-forward scanning services and provides a secure, thin client, scalable, storage and retrieval solution. Plus, the ECM component of the hosted solution assures easy integration within Microsoft-based organizations, while simplifying digitization of documents and making them searchable and accessible across a company. Since March 2011, Cornerstone has been consistently adding new imaging clients, both from their existing client base and new clients.. Not surprisingly, each new customer signing has created new requirements for additional functionality. The DocPoint team, back by QAI, is providing ongoing consulting services to Cornerstone, making product recommendations to satisfy these needs and assisting with integration. Where the requirements exceed the scope of Cornerstone’s capabilities, DocPoint and QAI are partnering with Cornerstone to satisfy these requirements.